1. Scrub the apples and dry thoroughly. 2. Push a handle into the stem end of each apple (craft sticks or shortened chop sticks work well). 3. Prepare ahead: Place the Heath Bar bits and chopped nuts on plates or shallow saucers. 4. Melt the caramels and little bit of water in a double boiler. 5. Cool the caramel slightly, then submerge each apple in turn. 6. 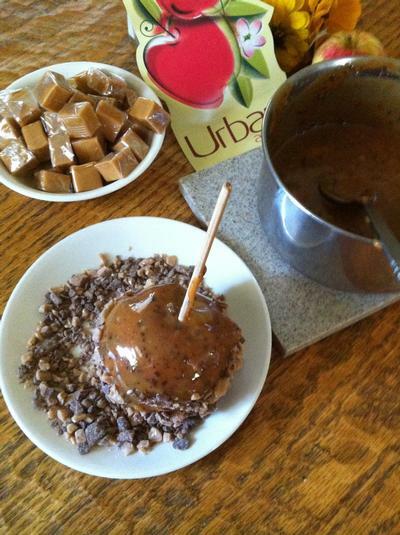 While still warm, roll the apple in the candy pieces or in the nuts for extra flavor.